In the heady days of the first wave of prog rock, decades before our current instant access era, if you had asked any prog fan worth his (rarely her) lark’s tongue to name any non-British prog band, PFM would more than likely be the answer. Ask the same person what “PFM” stood for and they may well have struggled for an answer; I know I would have done! Thanks in equal parts to the internet and having a good Italian friend in the amateur scribbling community, I now have a collection of Italian progressive music both old and new that is not far off the size of its English cousin, much longer resident on my shelves. Back in the day, having quickly taken up the prog mantle from our Sceptered Isle, it did not take long for the Mediterranean peninsula’s interpretation to rival the British version, both in the number of bands and in the vast array of styles collected under the original prog banner, from an era when “prog” still actually meant “progressive”. Premiata Forneria Marconi, or PFM as they were and are better known were the flag bearers for Italian forward thinking rock music. Like many of their British counterparts they were the end product of a metamorphosis from a beat group, and thanks to the assistance of a manager with contacts in the right places they quickly got themselves support slots for all the big British bands of the era. 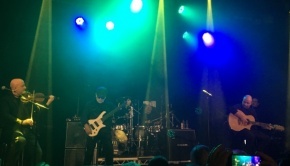 Their burgeoning reputation enticed names such as ELP’s Greg Lake to the 1972 launch gig for their second album Per un Amico, and so impressed was the bass man, he invited the band to London where they secured a contract with ELP’s label Manticore. They re-recorded and released Per un Amico the following year in an English version with lyrics penned by ex-Crimson lyricist Pete Sinfield. Now re-titled Photos of Ghosts that album for many years was the only non-English prog album in my, and I suspect, many others’ collections. Nowadays an Italian band would not be too concerned about producing English language versions of their albums as their sound can only be enhanced by that most poetic of tongues, and the far more connected audience of today are in a much better position to appreciate a band singing in their native language no matter where the band are from. However, back in those less enlightened times, releasing their first English language album and making their first UK appearance in 1973, a year that many including yours truly consider to be the zenith year of original prog was a stroke of luck for PFM as they went on to considerable international success. It is quite amusing to hear the no doubt unintentional but nonetheless slightly patronising lilt in Pete Drummond’s voice as he introduces the band to the listening audience on these “In Concert” CDs, but this was a different time in so many ways, not all of them better in comparison to today’s hectic and impatient world. Back to the story…later in 1973 the original bassist was replaced by Area’s Patrick Djivas, who brought a darker and jazzier edge to the band’s sound. PFM appeared on BBC TV’s The Old Grey Whistle Test for the first time on 22nd October 1974, and the promo film of the group playing Four Holes in the Ground live in a recording studio served to enhance their reputation still further and is included here. Returning to these shores in May 1975 to promote the Cook album, the band recorded a set for BBC Radio One’s “In Concert” series. 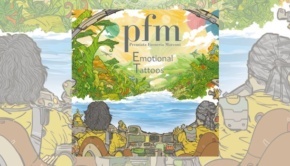 This constitutes CD1 of this box set, and finds PFM in fine form as they perform many of their well-known songs to an obviously engaged audience. Another appearance on The Old Grey Whistle Test, this time playing three songs in the famous minimalist setting of the OGWT TV studio shows the band in great form and is included on the DVD. They then recruited distinctive and energetic singer Bernado Lanzetti whose vocals are an individualistic but never off-putting mixture of Peter Gabriel and Roger Chapman, and he looks the “rock star” part, too. Lanzetti came from fellow Italians Acqua Fragile, a band that played a sun-drenched version of the Canterbury sound, and are a band who I recommend heartily. PFM recorded Chocolate Kings with Lanzetti, an album that would turn out to be their most commercially successful. Following their inaugural visit to Japan and their fourth sojourn to the USA, in April 1976 the band returned to the UK culminating in an appearance at the Royal Albert Hall. Another “In Concert” was recorded at the BBC’s Paris Theatre and subsequently broadcast on the 15th of that month and this is CD2. Preceding this radio show by two days was a final appearance on The Old Grey Whistle Test where the band performed the title track from Chocolate Kings, and it is good to see footage of Bernado Lanzetti in action. The band now show a markedly more fusion styled sound, and there are several examples I could use to highlight this, one being Franco Mussida’s stunning fast guitar runs on Alta Loma 5 ‘til 9 and Djivas’s equally fast’n’furious bass on Four Holes in the Ground. Video note – the audio and visuals shown on this YouTube clip are what you might term “lo-fi” in comparison to the high quality on the DVD in this release, and the spec is now as good as can be expected for such vintage footage. PFM now had a dedicated lead vocalist in the ranks which allowed the band to develop exponentially from an instrumental perspective, not that they were slouches to begin with! However, the progress in the band’s playing in the 11 months between the two “In Concert” appearances is nonetheless quite remarkable, as exemplified by Four Holes in the Ground which has nearly doubled in length thanks to a long instrumental middle section. This includes some great interplay where the electric piano of Flavio Premoli dances round Djivas’ incredibly fast chops in a manner any fusion band of the era would be proud of. Flavio Premoli is undoubtedly the star on this track and the instrumentation is built around his keyboards, in this instance mostly electric piano. The fusion section gives way to a flamenco rhythm on the bass slowly ramping up the intensity as Djivas shares the spotlight with Flavio’s jazzy runs, before the rest of the band join in to take the song back over the bridge to its more traditional RPI beginnings. This is prime-era prog rock at its best. 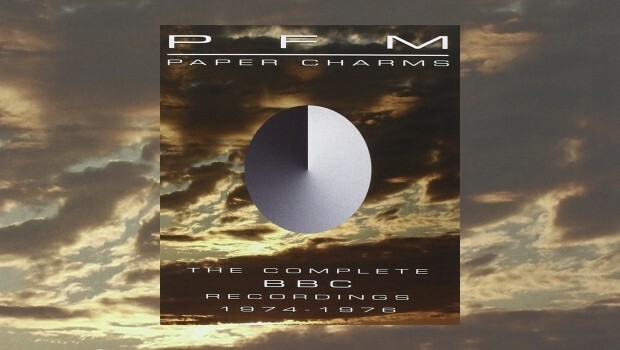 Gathering together all of PFM’s appearances at the BBC, both on the radio and on TV, Paper Charms stands as a document to the group’s most successful era. A thoroughly enjoyable slice of history over 2 CDs and a DVD that shows how fast the band developed musically in under a year, and including an informative booklet that is well up to Esoteric’s usual high standards, this box is damned good value for money too. What have you got to lose?